Sarah and I are excited to share with you the third installment of Cooking from your herb garden. In case you missed it, this series will include wonderful information about cultivating and cooking with fresh herbs. That means each week you'll receive information on growing and caring for specific herbs at home, tips and techniques for using the herbs, and a fun recipe or two to get you started! Our goal is to empower you to cook at your whim using what's fresh and easy, with the confidence that your meal will be awesome without too much extra effort. Oh cilantro, the most polarizing herb out there. You either LOVE it or you HATE it. In fact, in culinary school we had a whole discussion on cilantro. On one hand it adds such flavor and depth, but on the other hand there's a good chance your customer will think it tastes like...soap. The only other time I've heard of a food referred to as soap-y in flavor was from my sister, and well, she was talking about cucumbers. Yeah, cucumbers.. the least offensive vegetable on the planet, so sorry if I didn't take it too seriously. I happen to fall in the LOVE cilantro (and cucumbers) camp and during this lecture there was a clear divide in our classroom. I had never heard of such a distaste for cilantro but the proof was in the pudding (ugh culinary puns, I love you). Right in front of my very eyes existed a group of culinary professionals scrunching their faces in disgust of cilantro. How could this be? My sister's cucumber thing is a fluke, there can't actually be soap-y flavored produce out there. BUT IT'S REAL. Like really real. Like genetically real. So, for all my soapy friends out there. Don't fret... in most dishes, parsley will be a fine substitution. And for all my cilantro loving friends, well..let's do this!! When I worked selling plants at the farmers' market, we got a lot of questions about cilantro. Mainly, "It went to seed already! What did I do wrong?" Our answer was always, "That's what cilantro does. You probably did nothing wrong." Cilantro is rather short lived. One plant will not last an entire growing season. This, my friends, is almost all you need to know about growing this herb. Even as farmers selling cilantro plants, we would always encourage people to buy a packet of seeds. Plant every few weeks for nonstop cilantro goodness. And don't fret about cilantro going to seed. Those seeds are coriander. Harvest and store them for use in colder months when fresh cilantro is long gone. It's a good idea to let some of the seeds drop as this will result in another crop of fresh cilantro, especially in milder climates. Cilantro likes sun but can also tolerate a bit of shade. I've actually found it to prefer a bit of shade during the hottest days of summer. Water thoroughly when soil is dry, but do not overwater. Better for the soil to be a little dry than too wet. Don't pull the leaves from the stems. Cut it all up together. The stems are chalk full of flavor and I find it helps provide a little balance to the potential soapiness. Just like with parsley, best to add it after your dish has come off the heat, or to a no-cook dish. Cilantro is a tad bit more fragile than it's Italian friend Parsley. If you're buying it from the store, I've found the best storage technique is to keep it wrapped in a paper towel (dry towel if the cilantro is damp, or a slightly damp towel if the cilantro is dry) and in a airtight glass storage container, or plastic freezer bag, in the fridge. 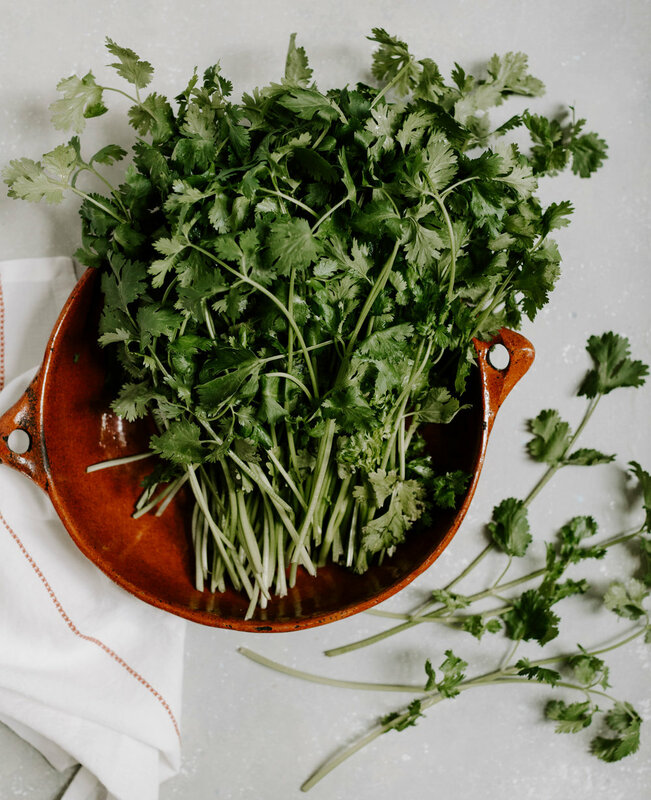 The best way to clean delicate cilantro is to place it in a salad spinner, or in a colander and a large bowl, and submerge it in very cold water for 2-5 minutes, use your hand to shake the cilantro around a bit, then lift the colander to drain. Dump the dirty water and repeat at least 2 more times for a triple wash clean. You could give spinning a try if you have a large quantity, otherwise dry with a towel in an even layer on the counter. Pair it with equals. What I mean by this is, cilantro is a strong flavor. If you want to use cilantro to add flavor, rather than distract you from the other flavors, add it to a dish using other strong flavors. If you want to taste only cilantro, add it to a dish with subtle flavors. I particularly love pairing cilantro with spice. That's because cilantro can hold its flavor with the very dominant taste of spice. Some of my favorite cuisines to use cilantro in are Mexican, Indian, Middle Eastern, and even some Mediterranean. I talk a lot about balancing flavors/textures/etc. So while cilantro plays well with spice, it also plays really well with creamy. I love cilantro in guacamole, gazpacho, or (and this is kind of a stretch in terms of "creamy") on a grilled fish taco with soft tortillas. Cilantro likes fat. In the culinary world we refer to fat as flavor. That's because it helps our taste buds register flavor (which is why fat-free foods are usually packed with sugars and other alternatives to provide flavor, but that's for another day). So pair cilantro with anything that uses a good amount of fat (healthy fats or otherwise).. whether that be olive oil for vinaigrettes, fried fish or chicken, a creamy coconut milk curry, or um.... guacamole. What are your favorite ways to use cilantro?? Let us know below! And keep an eye out for a yummy cilantro salad recipe hitting the site tomorrow!